I didn’t see the film when it first came out, but I saw Apocalypse Now, Redux and was stunned (and a little bored). What prompted me to write about the film was a remark that Stanley Kauffman had made some years ago to the effect that, yes, there are some remarkable films, but nothing of the caliber of the finest literature. Really, I thought, really? So when I started watching Apocalypse Now back in the summer of 2011 I wanted to see whether or not it made sense to think of a film being as good as a Shakespeare play. I convinced myself that this was a superb film and that the question of whether or not it was a good as, say, King Lear, was just silly. Shakespeare wins on poetry, lexis (? ); Coppola clobbers him on gorgeousness, opsis (? ), and melos as well (though I suppose this comparison is unfair in the way I’m using it as Coppola had the luxury of a sound track); on mythos, Shakespeare wins as Coppola had no plot to speak of; and it’s a wash on ethos because they’re all crazy. As for dianoia, I leave that as an exercise for the reader. Seriously, this is a great sprawling mess of a film. There’s a section where I slowly go through the opening montage, explicating the images as they come. There’s another section where I summarize the plot, from beginning to end, just to get the whole story into my head. Early in the working paper I’d remarked how the cinematography turned the jungle itself into a character (I hadn’t read Latour at this point, otherwise I surely would have brought him in). When I’d originally posted that material it garnered me an email from Walter Murch, a Hopkins graduate who’d done the sound on the film (which got him an Academy Award), quite a bit of the editing, and who also wrote a key scene (the sampan massacre in the middle). I figured I was on to something. But just what, in retrospect, I don’t know. I spend a great deal of time grappling with myth and ritual, not in Frye’s sense, but in the sense of Lévi-Strauss, Mary Douglas, Edmund Leach, and Arnold van Gennup, and Emile Durkheim. The film begs for such treatment, most obviously at the very end where Willard’s assassination of Kurtz is intercut with the aboriginal sacrifice of the caribao. Whatever else Coppola is up to in this film, he’s interrogating the state and its legitimacy. Kurtz, after all, had deserted the Army and so no longer functioned on behalf of the state. Willard was on a covert mission and in that sense didn’t exist within the state. The state would deny the existence of him and his mission. How does the state reach outside itself to prop itself up? Is that what is being done in that animal sacrifice at the end? But those people have nothing to do with the state actors in this film, not the USA, not North Vietnam, not South Vietnam. The film ends on the image of a Bhudda’s head (taken from Heart of Darkness). The state, for all spiritual purposes, is gone. I like what I did but I can’t say that I really have a grip on the film. Now we have two working papers, a short one, Myth: From Lévi-Strauss and Douglas to Conrad and Coppola, and a long one, Ring Composition: Some Notes on a Particular Literary Morphology, that are about form. The object of the shorter paper is to demonstrate that Heart of Darkness and Apocalypse Now have the same form, a looser kind of ring-composition that I’ve called center point construction. I do that by establishing cardinal points in each of the two texts and then arguing for a correspondence between the cardinal points in one text and the other. The method goes back of Lévi-Strauss in Mythologies, where he establishes correspondences between different myths and then argues for “transformations” between them. I believe that last aspect of his method is, at best, confused and don’t attempt it. But establishing correspondences allows you to argue from one text to another and to see form emerge as a kind of resonance texts establish in juxtaposition. In the small, as you know, it’s a rhetorical figure called chiasmus. In the large, it’s not clear what it is. For the most part it’s been the tool of classicists and Biblical scholars, which is where Mary Douglas found it. She spent the last decade of her life working on the Old Testament, but also argued that Tristram Shandy was a ring–though I’ve got reservations about that argument. Once she’d alerted me to the form and got me interested, I noticed a temporal anomaly in Osamu Tezuka’s classic manga, Metropolis (1949) and, after a bit of drudge work, discovered that the text was a ring. At that point I was looking at a modern Japanese pop culture visual narrative (aka comic) sharing a form with classical and Biblical texts. The game was afoot. It didn’t take me long to discover that two episodes of Disney’s Fantasia were rings: “The Sorcerer’s Apprentice”, which I discuss in the working paper, and “The Nutcracker Suite”, which I don’t. Over time I’ve added other texts to the group, including Gojira (the 1954 Japanese film), “To a Solitary Disciple” (Williams), a piece of literary criticism, “The Meaning of the Digital Humanities” (Alan Liu), and even “Kubla Khan,” which is where I started years ago at Hopkins. Much of the ring composition paper is devoted to explaining why and how each of these texts meets the criteria established by Mary Douglas in her Terry Lectures, Thinking in Circles: An Essay on Ring Composition, Yale University Press (2007). As a matter of fact some of them don’t meet the criteria, so I explain why I’ve relaxed the criteria. “Kubla Khan,” for example, isn’t a narrative at all and was long regarded (and dismissed) by some as a species of word music. But its symmetries are so like those of ring-form texts that not to discuss it in this context would be foolish. And then there’s Alan Liu’s 2013 PMLA essay on the digital humanities. I certainly wasn’t looking for rings when I started thinking about his ideas, but the text reached out and said “I’m a ring!” Another accident. What do I make of a form of textual symmetry one can find in poems, live action narrative films, animated films, a verbal narrative, visual narrative, expository writing, Western texts, Japanese texts, high culture and pop culture? What do I conclude from that? Only that there’s probably more out there, so let’s look for it. That is to say, if we look for things we’re not used to attending to, we’re going to find things, real phenomena, we didn’t know were there. Interesting things, maybe even important things. But new things. How can we not look? Are we scholars or automata? The issue needs to be put with a bit more subtlety, but it’s a real one. If there’s a crisis facing the discipline–institutional issues aside–it’s one of imagination, not of real intellectual possibility. The one place where there is some recognition of new opportunities is in the so-called digital humanities, with what Franco Moretti has called “distant reading” (FWIW, I think the trope of distance needs to be scrapped, but there’s no need to go into that here). A couple years ago Moretti and a colleague, Matthew Jockers, established the Literary Lab at Stanford. In 2013 Jockers published Macroanalysis: Digital Methods & Literary History. He took a corpus of some 3300 19th century British, Irish, and American novels and used computational techniques to analyze stylistic and thematic features in these texts. Jockers’ corpus included canonical texts, of course, but most of them didn’t make the canonical cut. They’re texts that no one reads any longer except for scholars with very specialized interests and even then, I suspect, many of these texts are not read. What can we learn from what Jockers’ has done? Jockers learned a lot, much of which I summarize. But most of the working paper is devoted to discovering things Jockers didn’t put in the book and that I wasn’t looking for. You see, it wasn’t merely the book I was looking through. One of the things that Jockers did was construct what’s called a topic model for his corpus. Just what that is, is rather technical and tricky, so I’m just going to do some tap-dancing and hand-waving. The basic idea is that words that consistently occur together in a lot of different texts are probably more or less about the same general topic. 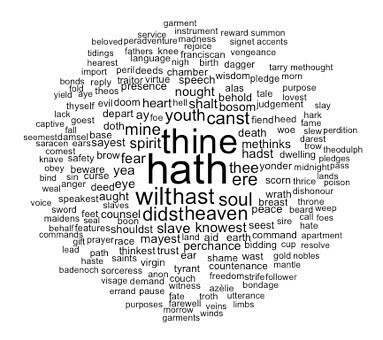 It turns out that if you’ve got a lot of computer power and some sophisticated statistics you can identify which words hang together across a lot of texts. In fact, the more texts you’ve got, the better. What you want is for topics to identify themselves, in effect, against non-topic backgrounds. More texts gives you more backgrounds. So, you tell the computer how many topics you want in the model and it does a massive cross comparison to produce them. When it’s done, it lists the words in each topic along with its frequency in the topic. It’s up to you to examine the list and determine whether or not it is in fact a coherent topic and, if so, you may choose to give it a label. Once you’ve got the themes, it’s up to you to make sense of them. You have to interpret them, to read them. Jockers discovered, for example, that English, Irish, American, and Scottish novelists had different thematic preferences, as did male and female novelists. Each topic also had a bar chart indicating the importance of the theme for English, British, and Irish novelists and another for Male and Female novelists. And then there were line graphs, one to show the historical distribution of the topic by gender and and one by nationality. 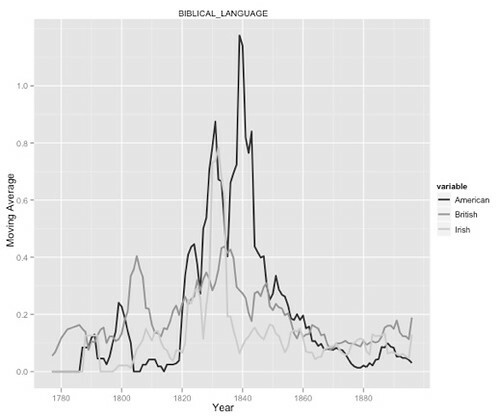 That’s a total of 2500 “snapshots” into the evolution of themes in 3300 English-language novels in the 19th century. Those charts are available to anyone who’s got an internet connection. You don’t even need to read Jocker’s book to access them, though the book gives you important information about how he created them and contains useful examples of how to work with them. This practice is fairly typical of digital criticism. 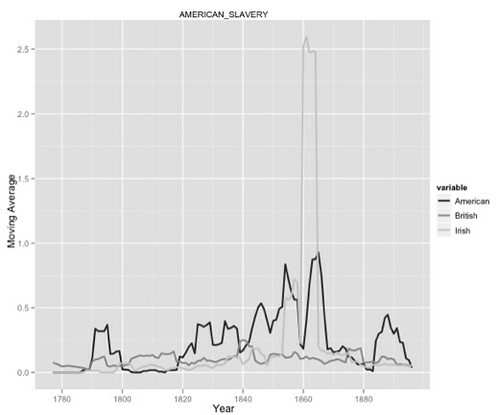 The most striking thing about that is the large spike in the Irish line at the beginning of the 1860s, that is, the American Civil War. Jockers informs us that this is due mostly to the books of Mayne Reid (Macroanalysis, p. 145). The British distribution is fairly flat through the century and the American distribution, while spikey, shows a rise up to and during the Civil War. Here the striking feature is the massive mid-century rise for the American distribution. I’d thought it might be either the second or the third awakening, but it’s between the two. Maybe it’s lagging the second or anticipating the third; maybe it’s the rise of Abolitionist sentiment; and maybe it is none of those. But the question can and must be asked. To answer it we’re going to have to look at some of those texts and look more broadly at American cultural history. And we should also look to the corpus itself; while it is a large one, it is still largely incomplete. Maybe things will be different when another several thousand texts get added. 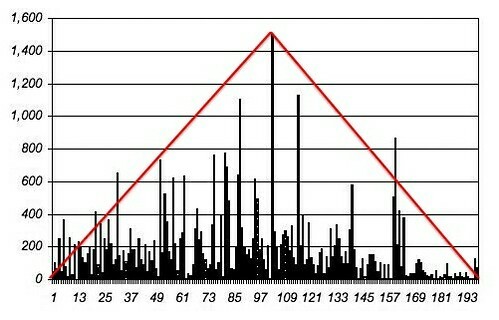 My basic point is simple: the computer produces (interesting) artifacts which must then be interpreted in light of various kinds of knowledge, including knowledge of the texts themselves (e.g. the novels of Mayne Reid) and history (e.g. the awakenings, the Civil War). In my working paper I spend some time looking, first for the Klondike Goldrush, and then for the California Goldrush. Then I got serious and took out a critical text from the Jurassic Age, Leslie Fiedler’s Love and Death in the American Novel, and used Jockers’ data to interrogate his arguments, and vice versa. In the large, they were a reasonable fit, but I reached no firm conclusion. I was just playing around. Alan Liu raised similar concerns in his 2013 PMLA essay, “The Meaning of the Digital Humanities”. Now that the author has given way to large intractable systems where is there room for us? Have we all every one of us been assimilated to the Borg? I make two arguments that speak to this problematic. In one case I follow Jockers in resurrecting the author from the dead and in the other I reinterpret a beautiful and elegant piece of work he did on influence. But to explain those arguments I’d have to write so much about just what Jockers did and then what I did, that I would, for all practical purposes, be engaged in recreating major sections of that working paper in this letter. This is already far too long. The terms in which Jockers is working with texts are quite different from those in which Said did his work. That means that, in order to address the question of an autonomous aesthetic realm, we’ve got to operationalize it in Jockers’ conceptual world. That requires a leap that is both epistemic and imaginative (operationalize: a concept Moretti has recently borrowed from physics). Such things are not readily explained. You just do them and see how it goes. I like the arguments I made, I like them a lot. But I don’t know how good they are. They need to be interrogated by people who know the discourse of “big data” better than I do and by people who know Said’s discourse better than I do. In a particularly interesting world they’d also be interrogated by someone who knows both discourses better than I do. Those young people may be out there, but they’ve not yet identified themselves to me. A couple of years ago two of those young people, Andrew Goldstone and Ted Underwood, decided to go big data on PMLA and do a topic model of the whole corpus. They published preliminary results to the web (standard practice), where I found them and entered into discussion with them, me and several others. That discussion led to this mysterious thing called philology. I mentioned having met Kemp Malone at Hopkins once. Underwood responded, “Kemp Malone (whom I had never heard of) darn near gets his own topic” (in the sense of topic I’d discussed above). That could happen only if “Kemp Malone” appeared in many different places across many articles. And that, in turn, would require that he have been an important and much-cited scholar. Which he was. Andrew Goldstone and Ted Underwood. “The Quiet Transformations of Literary Studies: What Thirteen Thousand Scholars Could Tell Us”. New Literary History 45, no. 3, Summer 2014. As is common in digital criticism, there is copious supporting material on the web. Computers are instruments that enhance our vision, and data processing enables us to see patterns where there were none before. What to do with those enhanced powers, that's the eternal question. One has to apply one's own powers of association and patterning to them, those that do not come along with the data, but rather with the observer. So we may get new data, which may even spark out new ideas, but that's still only half the job, the other half is as old as Heraclitus, when he said that "a wonderful harmony arises from joining together the seemingly unconnected". Or words to that effect. a fork in the road - take it!